I woke up with heaps of energy at 4:45 this morning and I was ready to leave for the gym 10 minutes earlier than usual! I always get that Adrenalin kick whenever my body runs low on sleep/energy... I will surely crash tomorrow. I did not really feel anything from this workout to be honest. My arms hurt a little but that's probably it. Okay, okay my arms do actually feel really sore! It hurts to raise my arms :(... I decided to skip yoga and hit the gym today instead. I'm feeling totally "fluffy" from eating a huge dinner late last night. 30 minutes of cardio; 5.5km/h treadmill. I was feeling HUNGRY after that workout and my trip to the grocery store and I was craving cookies. In attempt to avoid excessive refined-sugar consumption and to achieve complete satisfaction, I baked a giant (and totally clean!) blueberry cookie for lunch. Preheat the oven to 180 degrees Celsius. Blend the ingredients all together then scoop it on to a tray lined with baking paper. Add in the blueberries (or even chocolate chips -yum!!). Cook for 15-20 minutes or until golden (it's okay if it's a bit raw as the ingredients don't require cooking to be eaten safely + you can pretty much just eat the batter...). 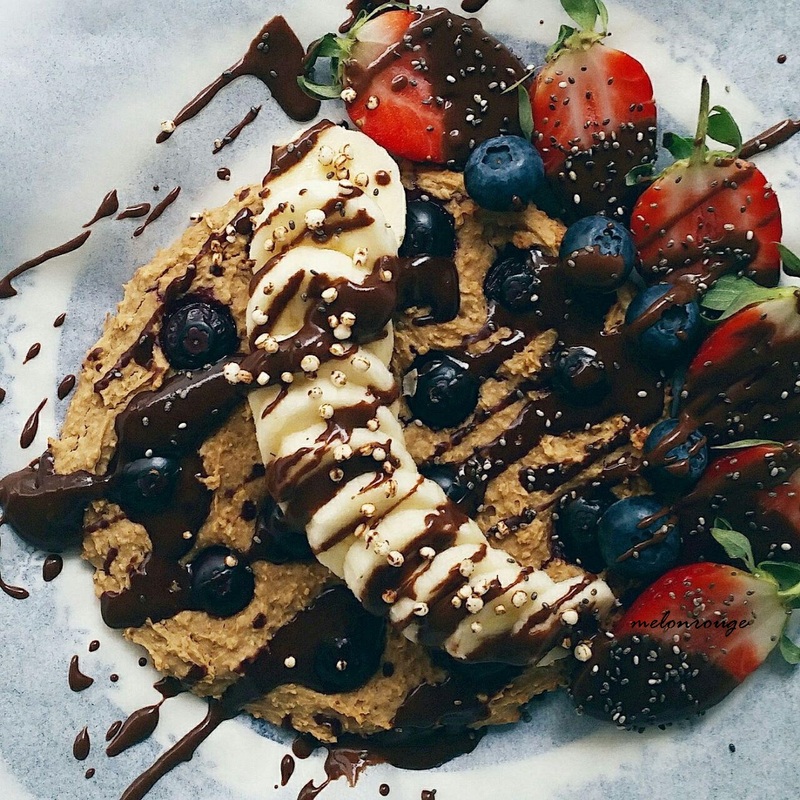 Drizzle with some cacao sauce, add some fruits and enjoy! I initially planned to make some banana icecream to go with it - how perfect would that have been? - but I wasn't really up for anymore cleaning hahaha. The result was a gooey, chewy texture. Not really like a cookie, i'd say... Maybe i'll try to bake it for a bit longer and see how that goes! I was too eager and impatient to wait any longer than 15 minutes. This totally to about 600 calories and was not 801010 friendly :P - nonetheless it was delicious and I would definitely go through this process again! I decided to try having some coffee before I left the house for the gym this morning. I'm not sure if I had slept well or that the caffeine-kick gave me the energy - well no matter the cause of motivation, this morning's workout was a baked-cake of success with a sprinkle of extra strength. I was tempted to try 25kg but I had failed all my previous attempts to clean and jerk 25kg. I should have tried it though because I was feeling extra strong (-er than usual). Usually require a lot of peer support from my coach and the other people in the class but this morning, I was able to push myself the majority of the time. I'm quite pleased with that.